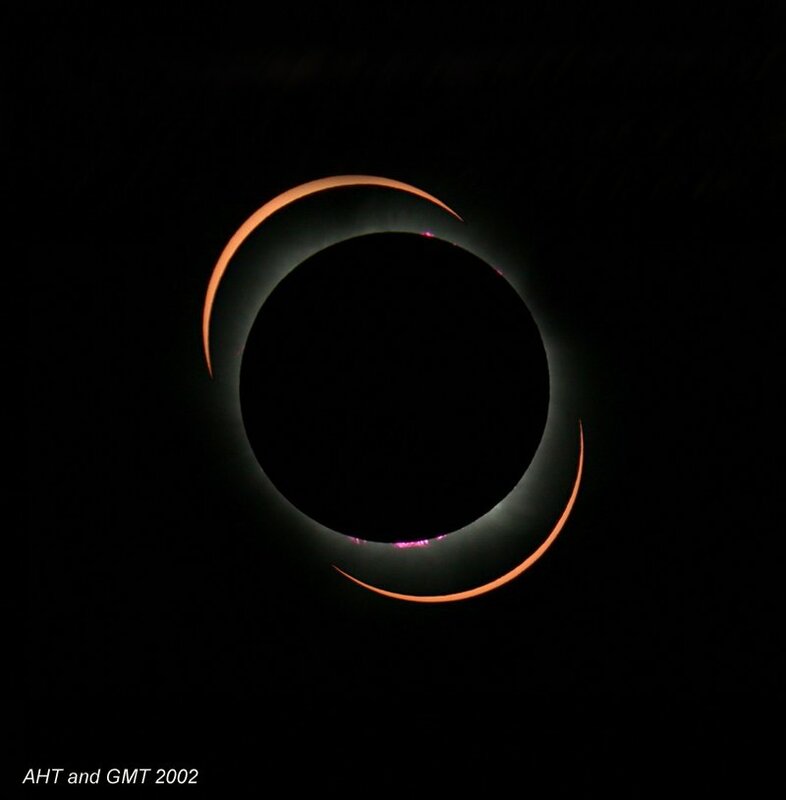 Summary: On Dec. 4, 2002, the new Moon passed in front of the Sun and cast a shadow on Earth. 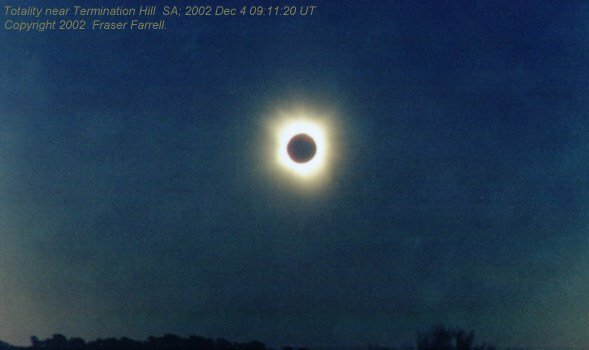 This caused a total solar eclipse in parts of southern Africa, the Indian Ocean, and Australia. Thousands of people enjoyed the event--including one person in space. 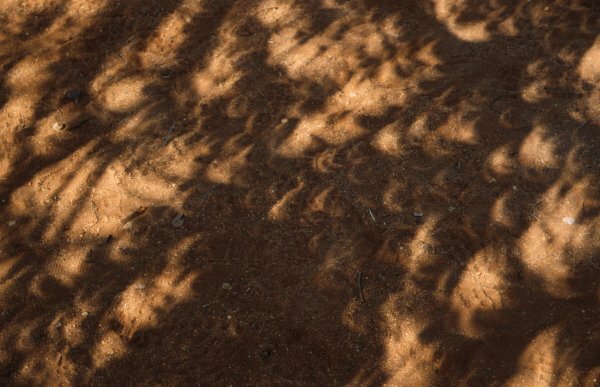 One of the sensations often overlooked in descriptions of total eclipses is the chill of the Moon's shadow. Note Gordon Telepun's data, below, which show how the air temperature dropped in Zimbabwe during totality. All images below are copyrighted by the photographers. 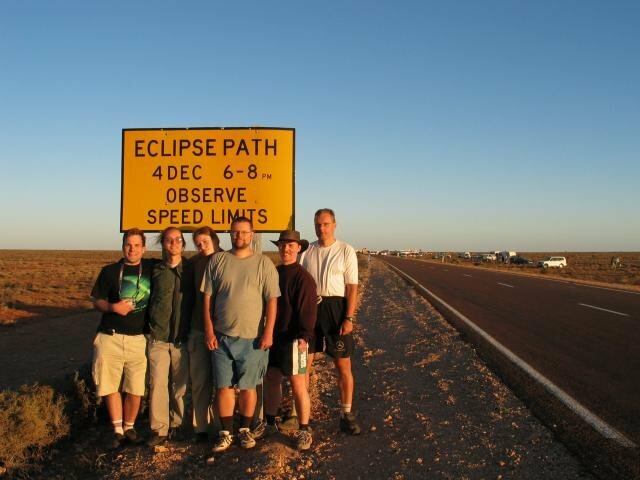 "The Moon's shadow was so narrow it was like looking down a tunnel and you could see it sweep across the sky," says Dale Ireland, whose wife Suzanne took this picture from the Australian Outback during the total solar eclipse of Dec. 4, 2002. M. Foulkes: "This composite image was taken with a 140mm F15 Maksutov; exposure 1/250 sec; D100 digital camera." 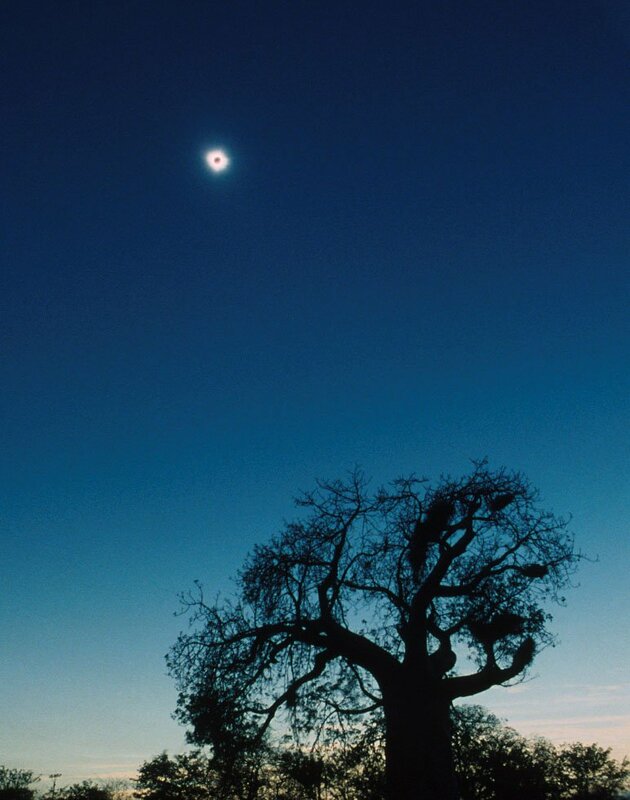 B. Hoehne: "A tour group of 22 eclipse chasers and a number of curious locals set up under a beautiful baobab tree in southern Zimbabwe about 15 miles north of Bietbridge. 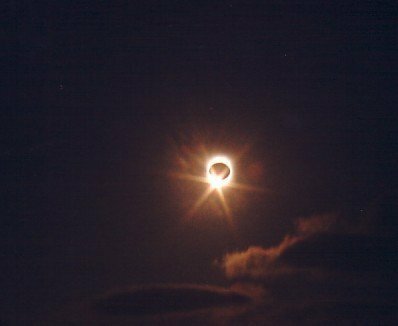 (Note: image #1 shows crescent-shaped beams of light filtering through the baobob just before totality.) 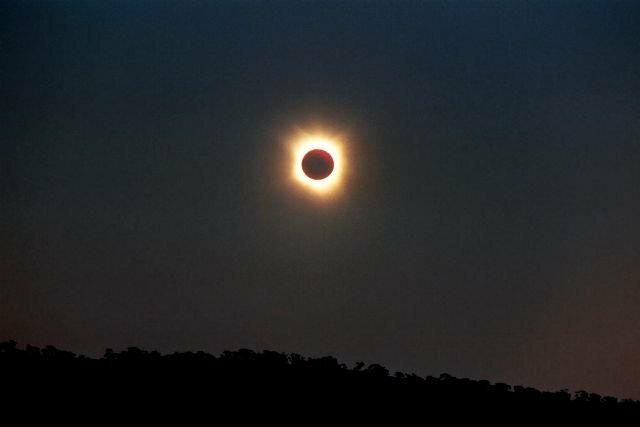 We witnessed about 1 minute and 20 seconds of glorious totality. The sky appeared to the eye a steel grey-blue. Lots of animal activity was witnessed. Shadow bands were very distinct, and evident on the red-brown dust and asphalt road. One member of our group managed to capture them quite convincingly on video tape. 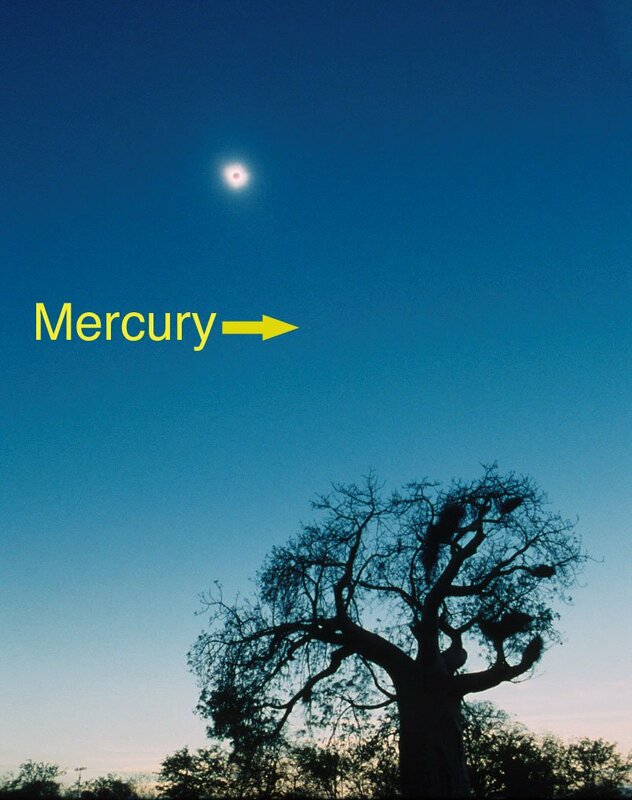 During totality Mercury could be seen quite easily with the naked eye. " E. Herranen: "Road officials had kindly put these road signs as well as a 60 km/h speed limit (instead of the standard 110 km/h) to the totality line. " 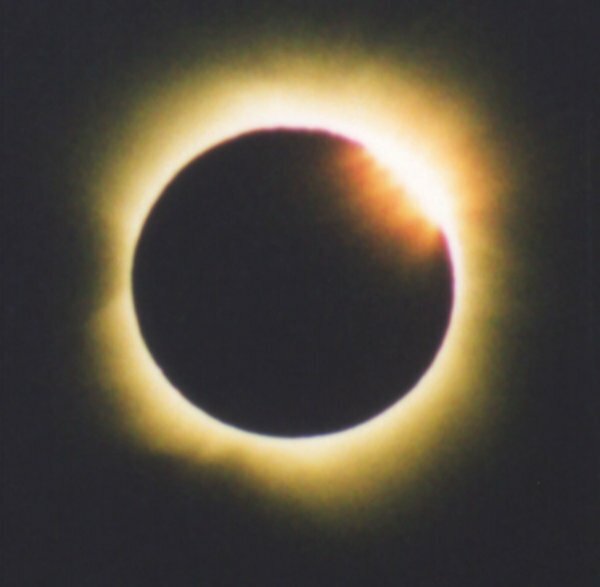 Click here to see many more pictures of the eclipse itself. 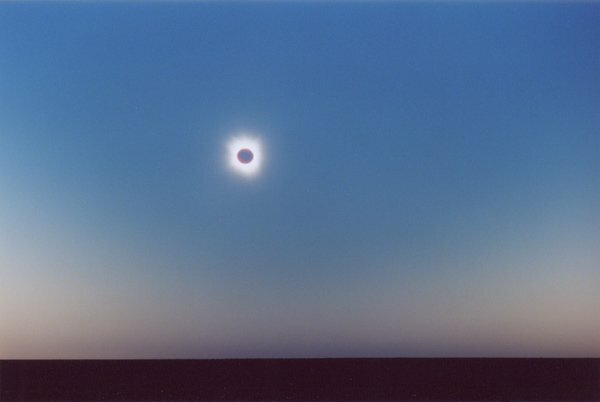 In this image, the sun's photosphere shines through two valleys along the horizon of the moon. Photo details: Fuji 400 slide film at prime focus of a Questar 90mm (EFL 1400 mm), 1/1000 of a second exposure. 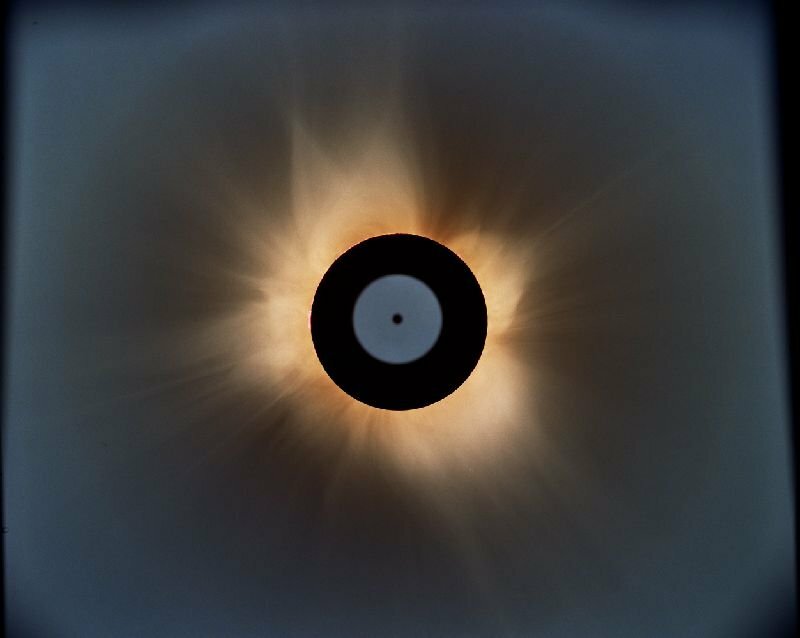 Telepun, who was inside the path of totality, monitored the air temperature during the eclipse using an iButton device. The temperature plummeted 6 deg. 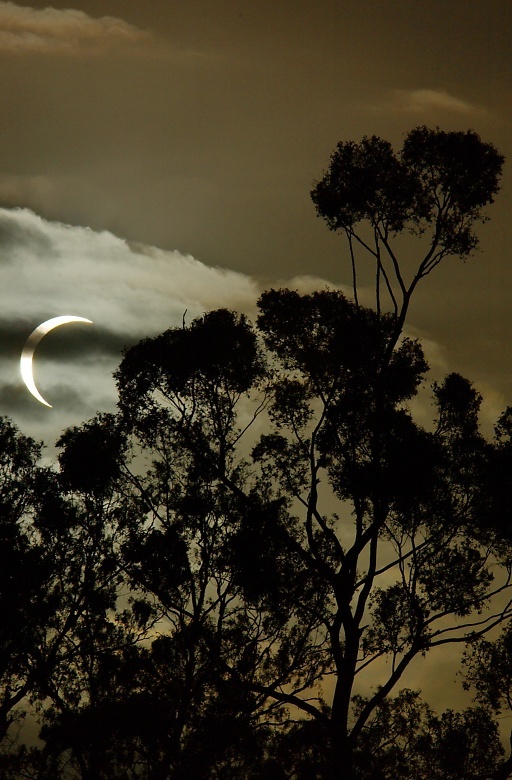 F when the Moon's shadow swept by. "I tested the iButton in an ice water bath," says Telepun. "It was perfect--right on 32 degrees F. My laptop was synched to the atomic clock in Boulder, CO, the night before leaving for Africa, so the times are correct within 1 or 2 seconds (laptop clock error over 6 days duration). 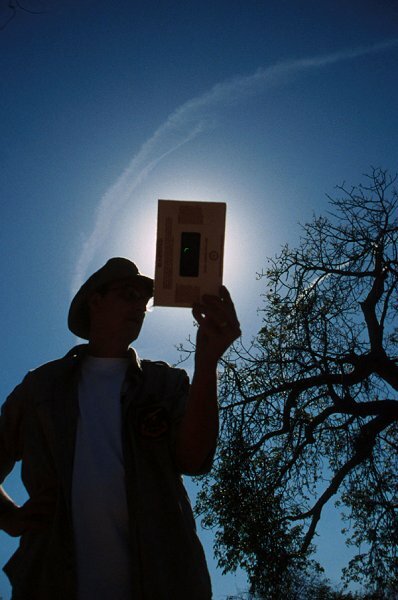 The iButton was 36 inches above the ground, hanging from the center pole of a tripod and shaded from the Sun with a white towel taped to the tripod legs. " 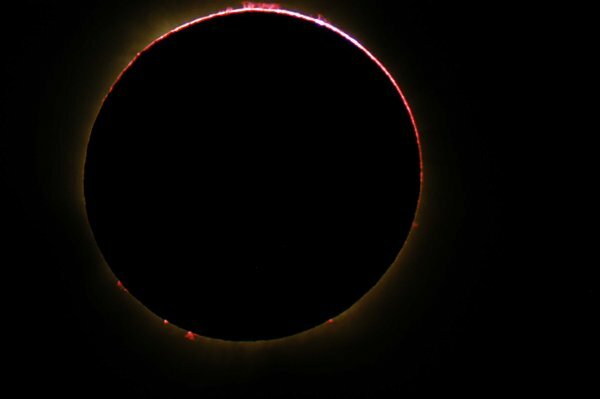 G. Telepun: "This artistic composite is crescent partial phases 2 minutes before and after totality on each side of a full disk exposed for the prominences. 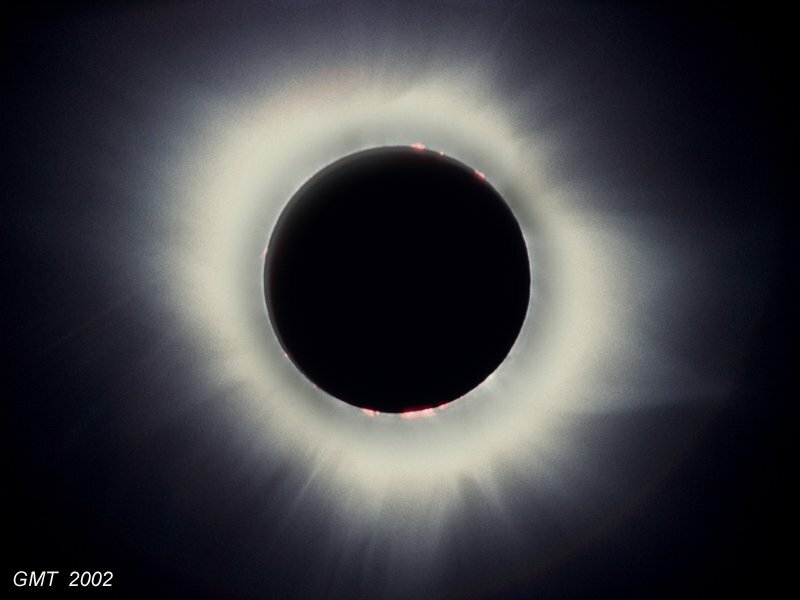 Usually you will see composite pictures using full corona exposures. I did that last year. I think that this composite is different and interesting." 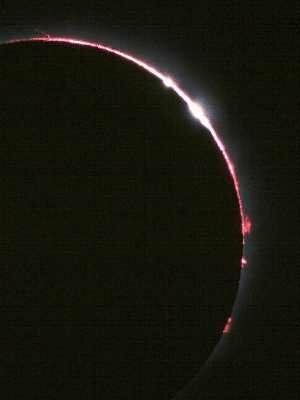 D. Johnston: "I was on vacation in Adelaide, Australia at the time of the eclipse - about 300km or so from the path of totality. It was cloudy most all the day (same for Ceduna) but at the right time, the clouds parted... and in my case, they actually enhanced the photographs by dimming the sun enough that it didn't wash out the rest of the photo. 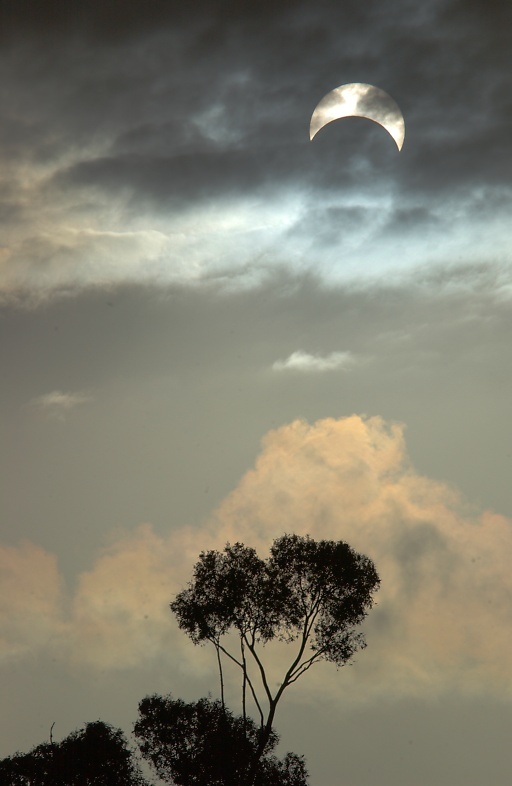 I was trying to get shots of the landscape and the eclipse together since this was going to be a near sunset event. #1 is well before the maximum (Nikon D1x, 1/3200 sec, F/10 at 300mm); #2 was taken very near the maximum for Adelaide, which was about 88% (Nikon D1x, 1/6400 sec, F/10 at 270mm)." Space Station science officer Don Pettit looked out the window on Wednesday during the total solar eclipse of Dec. 4th, and this is what he saw: The dark spot near the Earth's limb is the Moon's shadow, which at the time of the photo (approximately 0756 UT) was racing across the Indian Ocean. This is NASA image # ISS006-E-5065. Lyndhurst, Australia. 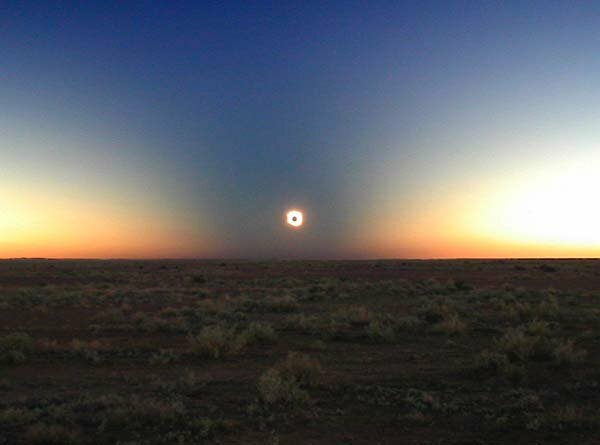 Lyndhurst has a normal population of 26, though on Dec. 4th there was an outback eclipse festival, which swelled the population to several thousand. We had crystal clear skies all day, but fought high winds and blowing dust. We took our 3 year old son for his first eclipse. 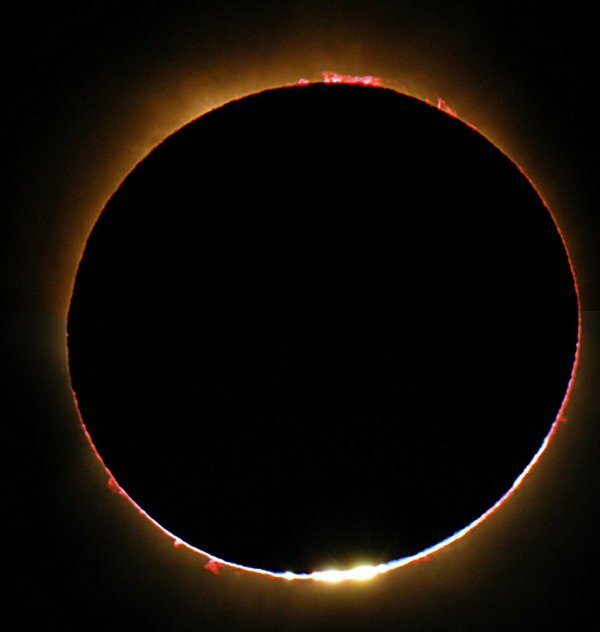 He was so excited afterwards--'The sun went totally black and there was a ring of *fire* around it!'" K. Jones: "Note the shadow cone present in photo. It was awesome--like being in some sort galactic worm hole or eye of a hurricane. 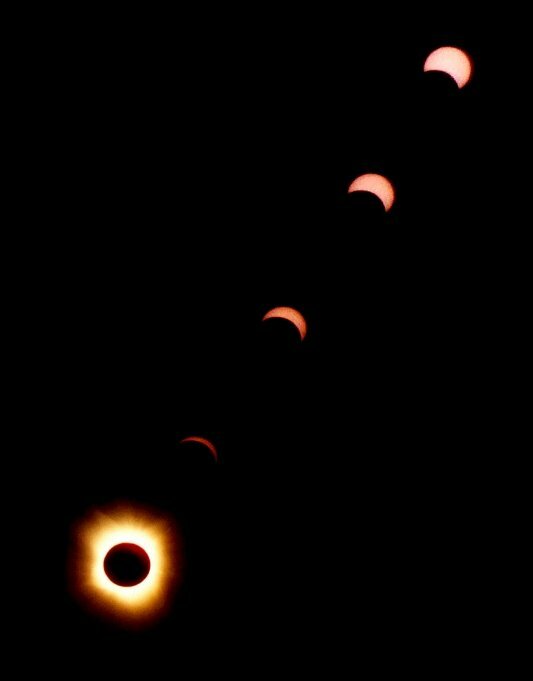 The ferocious blustery wind did drop off dramatically with the advent of totality and then slowly resumed as the sun came back out. Amazing! 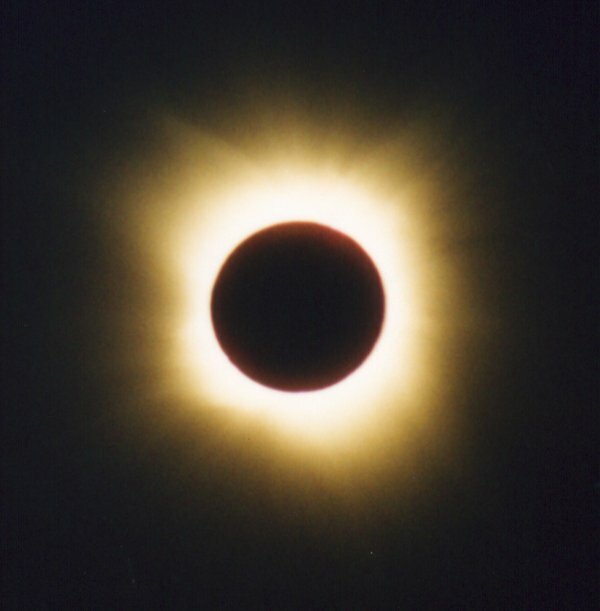 And all of us reported the sensation of being blissfully alone during totality. I want to see another one--to see if I imagined it all!! Special effects cannot ever match this awesome spectacle." 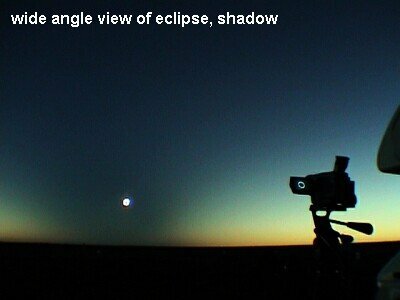 This is a wide-angle view of the ongoing eclipse and the surrounding moon-shadow. C. Maybury: "We traveled 10 days on a bus from Sydney to Ceduna--half way across our continent. It was cloudy all day on Dec. 4th, but the clouds parted for totality. I grabbed my camera for this hand held shot of the corona and 2nd diamond ring. The people of Ceduna were great, a small town in the outback with a big heart. Ricoh camera 400 ASA on auto. " Photo details: 5 second Newkirk exposure (raw) obtained at 06:18:36 UT, 10 seconds following 2nd contact. a 300mm focal length telephoto lens with a Ricoh KR-10M SLR camera.